Smok X Cube Ultra Review - Daily Vaping Deals & The Best Vape Product Reviews at Vaping Cheap! Smok has released many mods over the past year or two, and the X Cube II and X Cube Mini were very popular when they were released. However, they both had their issues which certainly affected their performance or usability. Dual 18650 box mods have become increasingly popular as well due to their power output, features, form factor, battery life and more! With how fast the vaping industry has evolved over the past couple years, these newer box mods are offering more features than ever before, once again increasing the demand for them alongside the popularity. Now Smok has released the new Smok X Cube Ultra that relatively keeps the same form factor which many people loved, but added some necessary improvements as well as tons of new features which we will get into more into this review. Firstly, I would like to thank Gearbest for sending this product my way for review. In this review, I will tell you what I like and do not like about this box mod. In the conclusion, I will tell you whether or not I recommend this device! Click Here to Check Out the Smok X Cube Ultra! When first receiving this product, the first thing I noticed was how great the box looked. I know this is not the most important aspect to look at, but great presentation is always a good thing in my book. The box itself displays a large “X” with the words “Cube Ultra” down on the corner, which indicates the product. The look of the packaging looks very elegant, and honestly it seems like you are getting a much more expensive product than what you pay for. On the back, it does go over tons of information regarding specifications, what is included, an introduction and some warnings. Upon actually opening the packaging, it reveals the Smok X Cube Ultra right away. I received the stainless steel or silver version, but there is a black color also available. I actually do like the stainless finish, even though it seemed like a fingerprint magnet. One of the first things I noticed right away when I opened the package was how large this box mod was in comparison to the others I owned. I literally think this is the biggest dual 18650 box mod I currently own. Already, I knew this would be a con for some people, as many want the battery life and power of a dual 18650 box mod, but not the large side. However, I know there are some vapers who probably would not mind the size. I typically use much smaller devices in comparison as my daily driver, so I knew this is something I would probably have to get used to. One of the first things I wanted to check with the Smok X Cube Ultra was the battery door, because I know that there was a huge issue with the battery door on the previous version. Well, X Cube lovers rejoice, because this battery door is solid. There is very little play when tugging on it with my fingers, which is definitely a huge pro and a major improvement over the last model. Also, the magnets on the battery door are excellent and holds it in place firmly. However, sometimes putting the battery door back into place can sometimes be frustrating as it takes me a couple of tries to get it into the right position for it to close properly. For some reason if you do not angle it the right way, it will not close properly, so this was somewhat of a con. It is not the biggest deal in the world, but it is something to mention. This can be of an annoyance, especially if you are in a rush, and the battery door does not want to close properly. Also, there is literally no rattling at all going on with this device, which is again another huge pro. I personally get annoyed when there is tons of button rattle with a device, so I was certainly glad this did not exist with this box mod. When first holding the mod in the my hand, it definitely felt large. 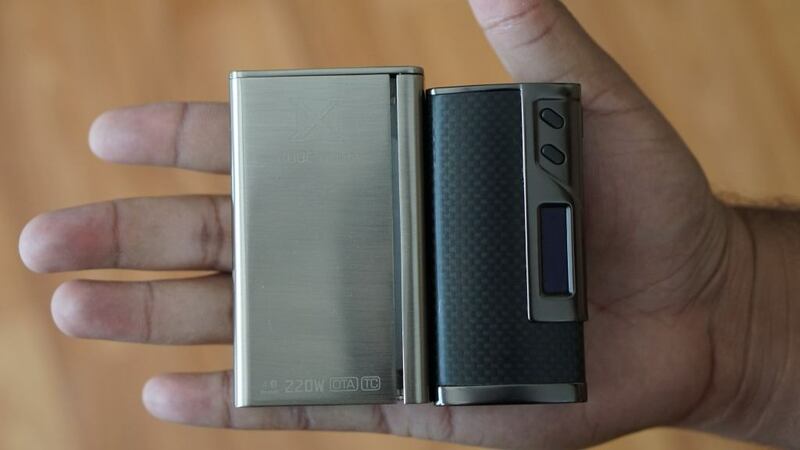 Like said before, I use smaller devices most of the time, and you can see the size difference in the photo within this article to the Sigelei 213 Box Mod. Even though it is quite larger than some of the box mods I own, I figured that after some time using the device, I should be able to get used to it. This is something definitely to consider if you are interested in this device. 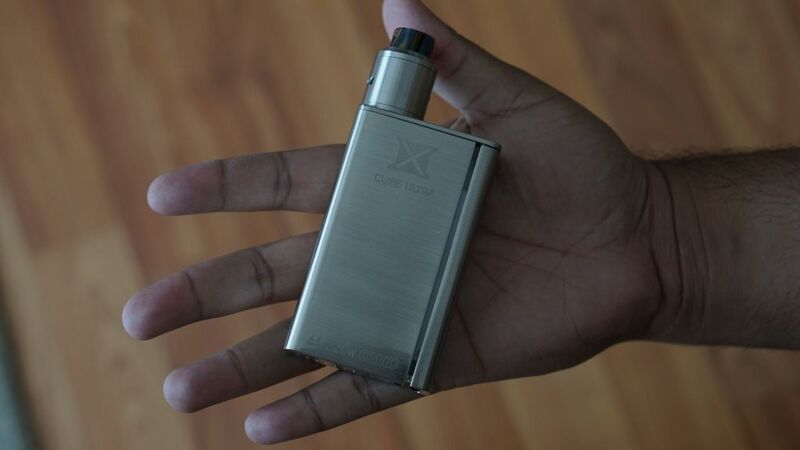 It is important to note though, that Smok says the new X Cube Ultra is 10 percent smaller than the original X Cube II. The build quality of this device felt really solid in the hands, and honestly it shows how far Smok has come with their devices. I am definitely glad that the build quality overall with Chinese products have improved over the past couple of years, especially this year. Another thing I noticed with this device is the screen size. It is pretty large, but not as large as the Wismec RX200S screen, but it is a good size overall. I was sure that once batteries were in, the screen would be of no issue to see. Just like the original Smok X Cube II and X Cube Mini, this device does feature a side bar firing system, where the entire side is your firing switch. Some people may like it and others might not. This is my first device with this style of firing mechanism, so it was definitely something to get used to. There is tons of battery venting along the bottom of the box mod, which is great, as this is something you can never get enough of. I recently published an article about Battery Safety right here and I go over some of the aspects of battery safety and how important it is. I cannot stress enough how important it is to understand battery safety. Feel free to also check it out with the link provided below! Click Here to Check Out the All About Battery Safety Article! The micro USB port is also on the bottom of the device for charging and firmware updating. It may be a con to some that this port is on the bottom of this device. Also, I do not recommend charging your batteries within this device, as I always recommend charging your batteries externally. Included with this device you do receive a battery warning card, which I think is a huge pro. I think more companies should be sending this type of information along with their devices, as some people may not be as informed about this topic. You also receive an instruction booklet, warranty information and a micro USB cable. These are all the typical things you would find with any box mod. All in all, my overall first impressions of the Smok X Cube Ultra were positive. This device seemed like a well built device, even though it is on the larger side. In the next section, I will go over my experiences using the device. When first using this device, I definitely had to get used to the size. It really is a large box mod, and like said before some people may not like that. However, after using it for about a day or so, the size really wasn’t an issue for me anymore. It actually felt comfortable after using it for a while, but of course this is subjective and some may not find it comfortable. Also, this device is a bit heavy with two 18650 batteries installed. It is not extremely heavy by any means, but definitely on the heavier side, so this is something you may want to take into consideration if you are looking to purchase this device. Another thing worth mentioning is that the stainless steel version I have is a fingerprint magnet. If this is something you dislike, then do not choose this color variation. I cannot speak on the black color as I do not have it. Even though the battery door is much more secure than before, the battery tray is also the same. It is kind of a tight fit for your batteries, especially on the left side, which is the battery closer to the firing bar. There were times where I felt that I would tear the battery wrap due to how snug the fit was, but that never happened. It is something to mention, but not really a con by any means. Also, since many devices that I do own have the display screen on the side of the device, it did take a small amount of time to get used to the screen being at the top. Also, atomizers that leave any type of condensation will make the screen a tad bit blurry due to the condensation. This is not a huge issue, but it is something to note as this would happen often with many of my atomizers. In addition, I definitely had to get used to the side firing bar. It does light up like the previous X Cube II, which can be turned off if you do not care for it or like it. Just like the size of the device, I also got used to the firing bar fairly quickly. I ended up liking it over some time, as you can press almost anywhere for it to fire. Also, you do not have to press it all the way in for it to fire, you can slightly push it about quarter way for it to fire. This is can be seen as a con perhaps since it does fire with it being fired only quarter way in, but it was not a concern for me. However, if you are careless with this device, just be mindful that it does not have to be fully pressed for it to fire, so always make sure you lock this device or turn it off when it is in your pocket or purse, just to be on the safe side. What really caught me off guard with this device is that it vibrates. 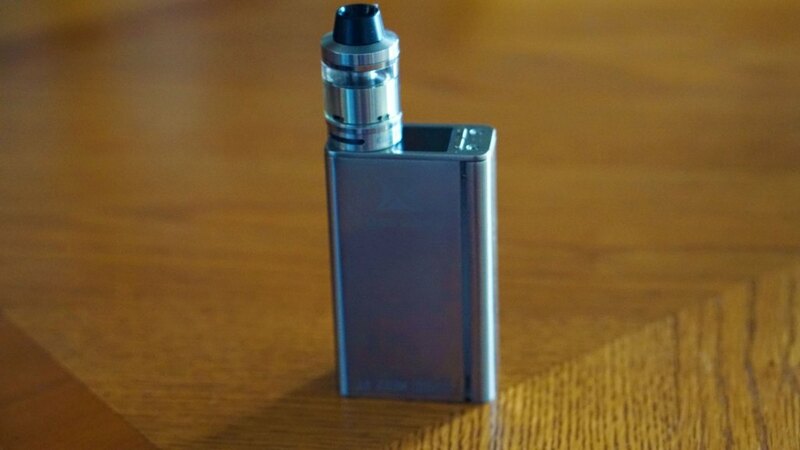 Every time you attach an atomizer, change the wattage or do almost anything really it will vibrate. Thankfully, this feature can be turned off, as it may bother some. I did get used to it over some time, and did not bother taking it off. You can easily navigate through the menu system with the wattage up and down buttons. To access a setting you long press the fire button. It really isn’t too complicated, but like said before some vapers who are not used to it may find it complicated at first. Five clicks of the fire button will lock the device. To turn it off completely, you do have to go into the menu and turn it off from there. This may be a con to some since many devices are five click on and off. This device does feature temperature control and you can adjust the TCR settings so you can fine tune your vape experience. In addition, this device does feature bluetooth and you can update the firmware on this device via OTA (Over the air). This is featured in some of Smok’s newest devices, and is definitely a huge pro as you do not have to connect to any computer to update it! Also, with the app itself you can easily control the settings for this device. Personally, I did not care to use the app to control anything as I typically just vape in wattage mode and adjust everything on the device itself. However, it still is a pro since it is featured and is there if anyone wants to use it! The screen is very bright and easy to see. The wattage is displayed the largest, and the other information such as atomizer resistance, battery life, puffs, voltage and what output mode you are in is displayed much smaller. This can also be seen as a con since the information is quite small, and may be difficult for people to see, but for me it wasn’t. 25mm atomizers do sit flush on this atomizer without any overhang. This is another huge pro, as many new atomizers are larger than 22mm. 22mm atomizers did not look weird or anything either, so if you use mostly this size of atomizers, I would not worry. However, any atomizer larger than 25mm will have a hangover. Also, I attached some atomizers with very long 510 pins such as the Kennedy 24 RDA, and there was little to no gap. So the 510 connection on this device seems to be great, which is a huge pro since many people always question this with any device. All in all, I enjoyed using this device. There were many things to get used to such as the size, weight and firing bar, but it was a great experience overall. In the next section, I will go over my experiences with the performance of this device. Firstly, this device is marketed to deliver a maximum output wattage of 220w. How accurate is this, I cannot really say as I do not have the equipment to test its accuracy. However, I can tell you at the wattages and modes I used with this device seemed relatively accurate. Like said previously, this device does feature temperature control for Ni200, Ti and SS wire. 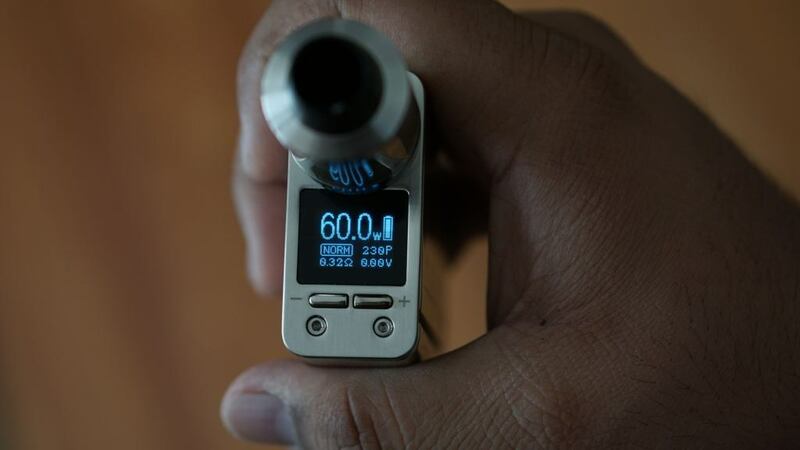 In addition, you can adjust the TCR setting to fine tune your vape experience, which is handy especially if you are during different types of SS or other wire materials. When using this device in temperature control, it worked flawlessly. I have no issues with burnt or dry hits, and the temperature seemed to be where I set it to. However, I do want to note that I used this device in stainless steel temperature control mode, as I do not vape Ni200 or Ti often. This device also features five different output modes which are Max, Minimum, Hard, Normal and Soft. These all worked just fine, and you can certainly tell a difference between them while vaping. I found that with Clapton coils this is definitely a nice feature to have as with Hard or Max mode, it gives you a nice bump in power to ramp up the coils quicker. I do want to mention that this device was not as accurate as a DNA200 device in wattage mode. I felt that it was slightly underpowered in comparison, but not by much. When vaping the same atomizer with the same resistance, I would have to set the wattage slightly higher with the Smok X Cube Ultra in comparison to a DNA200 device. This is not a huge con, but it is certainly something to mention. The resistance readings were also not as accurate as a DNA200 device. It would always be about 0.01 or 0.02 above the resistance that I would get on a DNA200 device or an ohm reader. That is not a huge issue, as it is minimal, but it is something worth mentioning. In addition, there is a noticeable delay when pressing the firing bar. This is very noticeable when you leave the device for a small period of time, and come back for a vape. It seems like this device has to “wake up” before actually firing. This is quite annoying, and may be an issue with the firmware. It is important to note that I may not have the latest firmware update on this device, so this issue may be fixed with a firmware update or a future one. However, I will comment down below once I update the firmware to inform you whether or not this issue is resolved or feel free to comment if you have a firmware update that has fixed this issue. The minimum firing resistance of this device is 0.06 ohm in TC mode, but I did not have a build that low to test this nor do I feel comfortable vaping at that low of a resistance. However, I did fire an atomizer with a resistance of 0.1 ohm, and it fired it with no issues in both TC mode and Wattage mode. The battery life on this device was on par with any other dual 18650 box mod on the market. I would typically get through most of the day before needing to change the battery. However, this device will drain your batteries quite low if you use it a lot without giving any low battery warnings, so keep that in mind. My batteries got drain down to under 3.4v at one point. Overall, the performance of the Smok X Cube Ultra was excellent. Even though it may not be as accurate as some other more expensive devices, it still is a great performing box mod. Even though this device performed admirably, there is still some cons to be mentioned, which is what I will get into next! There isn’t really a ton of cons to this device, and most are subjective. The first con to be mentioned is the slight delay when you press the firing bar. Like said before this could be fixed in a firmware update, so it may not be a con any longer. However, I did experience this when using this device out of the box, so it is worth mentioning. The second con is the accuracy. Even though this is not the biggest con, it still has to be mentioned. Like said previously, I do have to increase the wattage slightly in order to receive the same vape experience that I would on a DNA device. In addition, the resistance readings are slightly off as well in comparison. These are not deal breakers by any means, but have to be mentioned. Another con is the battery door. Even though it is a huge improvement over the original X Cube II, for some reason, the battery door has to be in a specific angle to close properly. This is definitely a minor con as the battery door itself it held firmly in place, but still has to be mentioned. A subjective con is the size. The Smok X Cube Ultra is a large device, and there’s no other way to put it. If you do not like big devices, then this is certainly not a box mod for you. Another subjective con is the screen placement. Some people may not like the display screen on the top of the device. I got used to it rather quickly, but it may be disliked by others. Also the weight is another subjective con to this device. 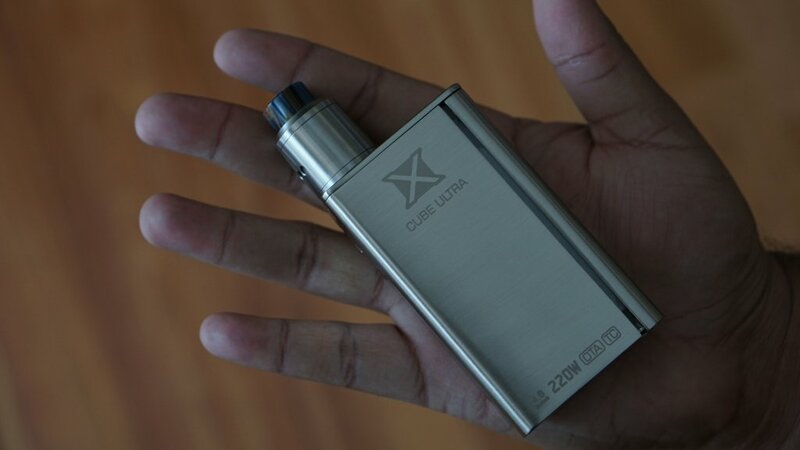 It is on the heavier side in comparison to many other dual 18650 box mods, so some people may not like this. In addition, the side firing bar could be seen as a subjective con. Of course, if you are purchasing this device it is to be expected since it is based upon the original X Cube II, but still some vapers may not like it or find it comfortable to use. The next subjective con is that the stainless steel version that I received is prone to fingerprints. I literally have to constantly wipe it to get rid of all the fingerprints. Like said before, I cannot speak on the black variant. The last subjective con to be mentioned is that the micro USB port is located at the bottom of the device. You can update this device via the OTA, but some may prefer to use the micro USB port. In addition, some vapers may want to charge the batteries using this port as well, even though it is not recommended. As seen, many of the cons listed were subjective, and the biggest con can be fixed with a firmware update (or is fixed already with an update that is available). Overall, the Smok X Cube Ultra is a solid device, which leads me into the next section, my conclusion! In conclusion, the Smok X Cube Ultra is an excellent dual 18650 box mod. Even though it is quite big, it does pack a ton of features. The size and weight was something I got used to fairly quickly even though I mostly use lighter devices. The side firing bar may also not be for everyone, but I did get used to it as well. I actually found it comfortable after some time, as you can fire this device no matter how you hold it. This is a design Smok is using constantly, and I can see why. It does offer all the features you would expect from a newer Smok device such as temperature control, Bluetooth capabilities, high wattage output, supporting low atomizer resistances, tons of safety features and more. A feature that does stick out in comparison to its competition is its ability to update the firmware via OTA. This is definitely a great feature to have in any device as it is convenient, and you do not need a computer to do it! All you need is a smart phone, and you can update your device! You can also use the app to control this device, and adjust the settings. This is another huge pro, even though this is not something I used often, but it is nice that it is there if I ever need to use it! The screen is quite large, and relatively easy to read. Also, the different mode outputs such as Max, Hard, Minimum, Normal and Soft are a nice touch. It really is useful with Clapton coils, and I saw myself adjusting it often depending on the build in my atomizer. Overall, the Smok X Cube Ultra is a huge improvement over the original X Cube II. If you are a big fan of the original, then you will fall in love with this new version. The Smok X Cube Ultra offers tons of features, and some that are unique such as Bluetooth and OTA firmware updates. If you don’t mind its size and weight, then this is a dual 18650 box mod I highly recommend! I hope you found this review helpful in your next purchase! Feel free to leave any questions or comments below! Thanks for reading!